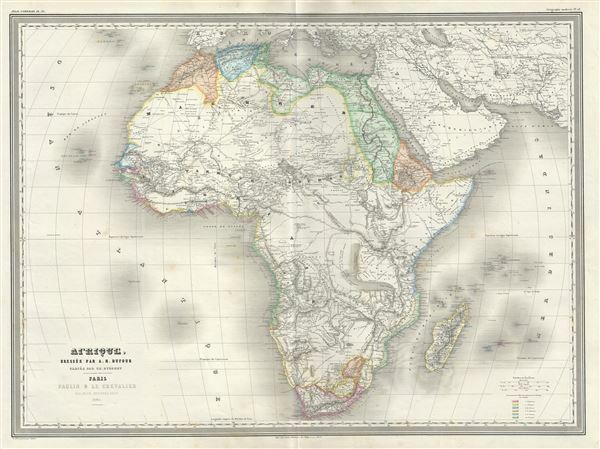 This is a large format 1860 elephant folio map of Africa by A. H. Dufour. It details the continent of Africa, including Madagascar, on the cusp of the great exploratory expeditions of the mid-19th century undertaken by Speke, Livingstone, and Stanley. Though European colonies and outposts dot the coastlines, much of the interior remains unknown, even speculative. Mt. Kenya, first sighted by western explorers in 1849 is identified. Africa is largely 'unexplored' though Lake Uniamesi, something that may be taken for an embryonic form of Lake Victoria, Lake Tanganyika, Lake Nyasa or all three of the Great Rift Valley lakes combined, does appear. This curious lake, supposedly identified by three missionaries in the 1840s and 1850s, was frequently written of in mid-century missionary reports as the source of several important African river systems, including the Congo. It was not until the expeditions of John Hanning Speke and Richard Burton in the late 1850s and early 1860s, that it was discovered that lakes Victoria, Tanganyika and Nyasa were in fact separate. The speculative source of the Nile is shown to be somewhere south of the equator. This map was prepared by Auguste-Henri Dufour and engraved by Charles Dyonette for publication plate no. 35 in Armand Le Chevalier's 1860 edition of Atlas Universel, Physique, Historique et Politique de Geographie Ancienne et Moderne.